It is always better to check for any possible memory defects on your computers and laptops before showing Random Access Memory error symptoms. Windows has an inbuilt tool to detect any possible RAM issues on your computer. This inbuilt device is called Windows Memory Diagnostic Tool. It checks for possible Random Access Memory problems on your computer and which will help you to report the issue successfully to hardware manufacturers. In case if Windows detects any issues with RAM while running, it will automatically open Memory Diagnostic Tool and let the user run it. You can also run this feature manually to ensure there are no problems with RAM modules on your PC. To run this feature manually to check possible RAM problems on your computer, follow the steps below. Double Click on it and now you will get an option to run the Windows Diagnostic Tool to check for your computer RAM problems. 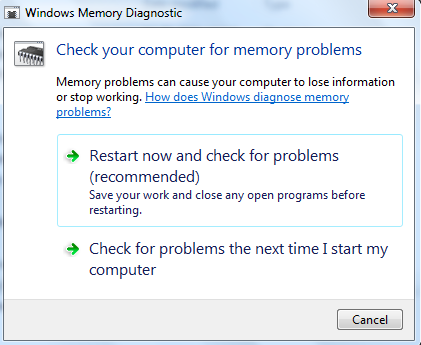 Click Restart now and check for problems to start the Windows Memory Diagnostic tool and check for issues with RAM on your computer. It may take a few minutes to complete the procedure and ensure that you have saved all current works on your computer. Click Check for problems the next time I start my computer if you do not have enough time to run the diagnostic tool now. Next time when you start your computer, it will start automatically. 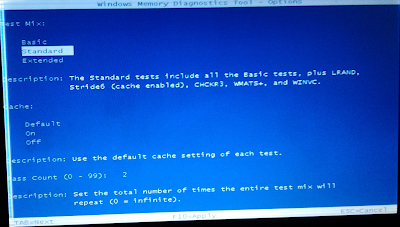 Windows Diagnostic Tool checks RAM by two-phase test. It may take a little bit time to complete the entire procedure and you will be notified in case OS detects any issues. Click F1 to get options and [Esc] to cancel the procedure. In options, you can set the tool to run in three different modes. Select the mode you want to check for memory errors and click [F10] to apply it. 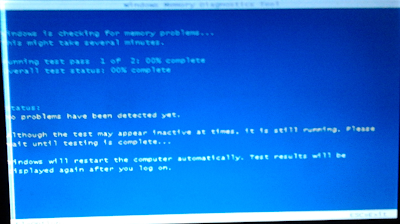 By Windows Diagnostic tool we can test any possible memory corruption on a computer. What we will do in case we face issues with data stored on a disc? In that case, we may follow the steps provided in the link below. Thanks for your comments Anand and BiYaGo.